Heres a great recipe from our fantastic tutor Kieran Lenihan. 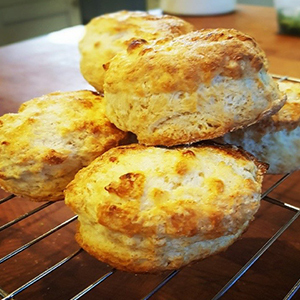 These scones are always a real favourite on our Beginners and Family Cookery Days. Please give them a try. Preheat the oven to 220C/gas 7/fan 200C and lightly butter a baking tray or use baking paper. Try not to overrub, as the mixture will be lighter if it’s a little bit flaky. Now stir in the sugar. Then add in the full fat milk into the mix to loosen it. Make a bit of a well in the middle of the flour mixture with a fork, then pour in most of this buttermilk , holding a little bit back in case it’s not needed. Using the fork, gently work the mixture together until it forms a soft, almost sticky, dough. Work in any loose dry bits of mixture with the rest of the buttermilk. Don’t overwork at this point or you will toughen the dough. Put the dough on to a very lightly floured surface. Knead the mixture just 3-4 times to get rid of the cracks. Pat the dough gently with your hands to a thickness of no less than 2cm and no more than 2.5cm. Dip medium round fluted cutter into a bowl of flour – this helps to stop the dough sticking to it, then cut out the scones by pushing down quickly and firmly on the cutter with the palm of your hand. Gather the trimmings lightly then pat and cut out a couple more scones. Cook for 10-12 mins til the scones have risen and are golden brown.